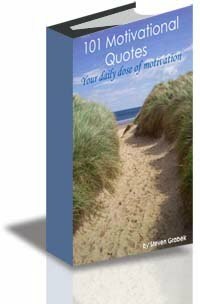 A selection of some of the finest quotes from famous motivational speakers, philosophers, historical figures and current day thinkers. Find the quote to empower and motivate you. By definition, motivation means "that which motivates, that which makes us take action toward our desired goals; and gives purpose and direction to those actions". Now we all know that very often we lose our motivation and we allow procrastination to dominate our life. With out our motivation we stop taking action and doing the things we really want to do, we stop achieving the things we really want to achieve and we stop believing we are capable of becoming who ever we want to be. This FREE, ready-for-download eBook discusses the foregoing, as well as the loss of motivation when procrastination dominates.